NeoOffice 3.4.1 Patch 5 can be downloaded from the NeoOffice patch download page by users that have paid US$10 (or €8 or £7) through PayPal. If you have any support questions, a list of suggested steps for finding an answer for a problem as fast as possible is available on the NeoOffice Support page. We have released NeoOffice Invoice 1.0.3 in the Mac App Store. NeoOffice Invoice is an easy to use app that helps you quickly create professional looking invoices for billing your customers. This version fixes a bug that disabled printing unsaved invoices in the Add Invoice panel. Important note for non-English users: while this version supports the currency and number formatting used in most countries, all invoices use U.S. English text. NeoOffice Invoice 1.0.3 can be downloaded from the Mac App Store. If you already purchased a previous version of NeoOffice Invoice in the Mac App Store, click on the "View in Mac App Store" button. This will show the NeoOffice Invoice product page in the App Store application on your Mac. Sign in with your iTunes account and you should see an "Install" or an "Update" button. Pressing either button will install NeoOffice Invoice 1.0.3. We have released NeoOffice 2014 in Apple's Mac App Store. With this release, NeoOffice is now a "64 bit" application. By moving NeoOffice from 32 bit binaries to 64 bit binaries, the NeoOffice engineers will be able to fully support NeoOffice on Apple's upcoming OS X 10.10 Yosemite release. Most NeoOffice 2013.5 users should not notice any changes in this version. However, the small number of users that use third-party ODBC drivers and native extensions will need to obtain 64 bit versions of their third-party ODBC drivers and native extensions. Steps for configuring MySQL's ODBC driver to work with NeoOffice 2014 are in this NeoWiki article. If you already purchased NeoOffice in the Mac App Store, you can upgrade to NeoOffice 2014 for free. When you purchase NeoOffice in the Mac App Store, you pay only once and no payment is needed to upgrade to any future versions of NeoOffice that we release in the Mac App Store. NeoOffice 3.x and OpenOffice users: we recommend that you read the list of changes before you upgrade to this version of NeoOffice. If you use Base, we recommend that you use OpenOffice with the Oracle Report Builder extension. The Base features in NeoOffice 2014 are much more limited than OpenOffice. NeoOffice 2014 can be downloaded from the Mac App Store. If you already purchased a previous version of NeoOffice in the Mac App Store, launch the App Store application on your Mac, sign in with your iTunes account, and you should see an "Install" or an "Update" button. Pressing either button will install NeoOffice 2014. If you have any support questions, a list of suggested steps for finding an answer for a problem as fast as possible is available on our NeoOffice in the Mac App Store page. We are pleased to announce the release of NeoOffice 2014 Free Edition. Thanks to generous bandwidth donations from the NeoOffice mirror sites, Mac OS X users can download NeoOffice 2014 Free Edition for free. NeoOffice 2014 Free Edition has the same features as NeoOffice in Apple's Mac App Store. The only difference is that NeoOffice 2014 Free Edition cannot save documents. Although NeoOffice 2014 Free Edition cannot save documents, users can open, edit, and print documents. So before you buy NeoOffice in the Mac App Store, try NeoOffice 2014 Free Edition to see if NeoOffice works for you. To download NeoOffice 2014 Free Edition, visit the our download page. Later this month, the NeoOffice engineers plan to release NeoOffice 2014.1 in Apple's Mac App Store. NeoOffice 2014.1 will include a new feature: native OS X grammar checking. The NeoOffice engineers have integrated Apple's OS X grammar checker into NeoOffice. 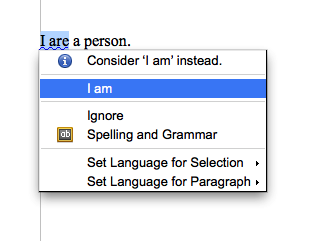 This new grammar checking feature automatically runs whenever NeoOffice's spellcheck feature runs. You do not have to wait until NeoOffice 2014.1 is released to try this new feature. NeoOffice 2014 and NeoOffice 2014 Free Edition users can try this feature downloading a test patch from this NeoWiki article. The NeoOffice engineers have added automatic grammar checking. NeoOffice will now automatically check for grammar errors in Writer documents using the Mac OS X grammar checker when spellchecking. NeoOffice users no longer need to install an OpenOffice grammar checking extension. An overview of this new feature is available in this NeoWiki article. To get this new grammar checking feature, download NeoOffice 2014.1 from the Mac App Store. NeoOffice 3.4.1 users can get this new feature by downloading NeoOffice 3.4.1 Patch 6. Before you buy NeoOffice in the Mac App Store, try NeoOffice 2014.1 Free Edition for free. If you already purchased NeoOffice in the Mac App Store, you can upgrade to NeoOffice 2014.1 for free. When you purchase NeoOffice in the Mac App Store, you pay only once and no payment is needed to upgrade to any future versions of NeoOffice that we release in the Mac App Store. Posted: Wed Jul 23, 2014 6:06 pm Post subject: Where are .docx, .xlsx, and .pptx in Open and Save dialogs? 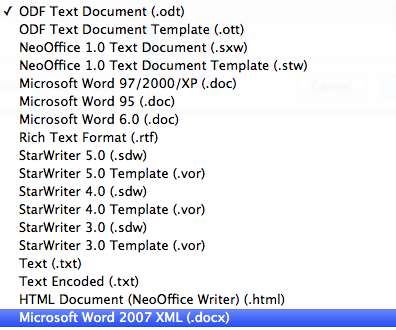 Some of our NeoOffice reviewers in the Mac App Store have reported that they are having trouble finding the Microsoft Office XML file types (.docx, .xlsx, .pptx, etc.) in NeoOffice's Open and Save dialogs because they are at the end of the list of file types (see screen snapshot at right). Since the Open and Save dialog file type lists are confusing, we plan to move the Microsoft Office XML file types above the older 97/2000/XP Microsoft Office file types in the next version of NeoOffice. You do not have to wait until the next version of NeoOffice to see this change. NeoOffice 2014.1 and NeoOffice 2014.1 Free Edition users can try this feature by downloading a test patch from this NeoOffice forum post. In August, the NeoOffice engineers plan to release NeoOffice 2014.2 in Apple's Mac App Store. NeoOffice 2014.2 will include the following new feature: improved rendering of Calibri and Cambria fonts in Microsoft Office documents. Many documents created in Microsoft Office use the Calibri and Cambria fonts. Unfortunately, Apple does not include these fonts in OS X and these fonts are only available from Microsoft. Because the height and width of Microsoft's Calibri and Cambria fonts is very different from most OS X fonts, text and tables in Microsoft Office documents may look very different in NeoOffice when the user does not have these Microsoft fonts installed on their Mac. Since many NeoOffice users do not have these Microsoft fonts, NeoOffice 2014.2 automatically uses Apple's Gill Sans font when Calibri is not installed and uses Apple's Times New Roman font when Cambria is not installed. You do not have to wait until NeoOffice 2014.2 is released to try this new feature. NeoOffice 2014.1 and NeoOffice 2014.1 Free Edition users can try this feature by downloading a test patch from this NeoWiki article. After Apple released Mac OS X 10.10 Yosemite Beta last week, the number of NeoOffice users who are running OS X Yosemite has increased significantly. As expected, many users are surprised that NeoOffice has some issues running on a Beta version of OS X. To help Yosemite Beta users be prepared, we have documented all of the known Yosemite upgrade issues. An important note NeoOffice 3.4.1 users: we have released NeoOffice 3.4.1 Patch 7 which can be downloaded from the patch download page. Posted: Sat Aug 02, 2014 3:49 pm Post subject: Mac App Store download or installation problems? If the steps listed above do not solve your problem, contact Apple's Mac App Store Support. NeoOffice 2014.2 is now available in Apple's Mac App Store. NeoOffice 2014.2 includes the following new feature: improved rendering of Calibri and Cambria fonts in Microsoft Office documents. An overview of this new feature is available in this NeoWiki article. To get this new feature, download NeoOffice 2014.2 from the Mac App Store. NeoOffice 3.4.1 users can also get this new feature by downloading NeoOffice 3.4.1 Patch 7. Before you buy NeoOffice in the Mac App Store, try NeoOffice 2014.2 Free Edition for free. If you already purchased NeoOffice in the Mac App Store, you can upgrade to NeoOffice 2014.2 for free. When you purchase NeoOffice in the Mac App Store, you only pay once and no payment is needed to upgrade to any future versions of NeoOffice in the Mac App Store. Over the last few weeks, we have been busily working on implementing support for OS X Yosemite's new iCloud Drive feature. After much debugging and testing, test patches with iCloud Drive support are now available for OS X Yosemite Beta users. Do you open and save files on a shared volume? Since iCloud Drive files can be accessed from multiple Macs at the same time, we had to make significant changes to NeoOffice's native file locking code to safely coordinate opening and saving iCloud Drive files. So, if you open or edit files on a volume that is shared with other NeoOffice or Microsoft Office users, we recommend that you try out the test patches even if you are not using OS X Yosemite Beta. Test patch download links are in the Yosemite Upgrade Issues NeoWiki article. The article also includes steps for Yosemite Beta and shared volume users to report any bugs that they might find in NeoOffice. Yosemite Beta testers: if you find any new bugs in OS X Yosemite Developer Preview 6 that the test patches do not fix, steps for reporting any Yosemite bugs to us are in the Yosemite Upgrade Issues NeoWiki article. When a document in iCloud Drive is open in NeoOffice and that document is moved to the Trash on a different Mac, OS X Yosemite makes the document unsavable. We fixed this bug by displaying a Save As dialog when closing the document so that the user can restore the deleted document. When a document is moved or renamed while open in NeoOffice, double-clicking on that file in the Finder will open a second window with the same document. We fixed this bug so that only the existing document window is moved to the front like normal. Yosemite Beta users and shared volume users: if you find any new bugs while working with documents in iCloud Drive or on a shared volume that the following test patches do not fix, you can e-mail a bug report to us using the steps listed in the Yosemite Upgrade Issues NeoWiki article. A few days ago, a reviewer in Apple's Canada Mac App Store reported repeated crashing while using NeoOffice 2013.2. Soon after that, we and another user started seeing crashes as well. We have fixed this bug and the test patch download links are in the Yosemite Upgrade Issues NeoWiki article. This fix will be available in a Mac App Store update in the next few weeks. In the meantime, if you experience any crashing in NeoOffice 2013.2, we recommend that you install one of the test patches in Yosemite Upgrade Issues NeoWiki article. If the test patches do not stop NeoOffice from crashing, you can e-mail a bug report to us using the steps listed in the Yosemite Upgrade Issues NeoWiki article.